A bathroom with claw-foot tub connects/adjoins these two rooms. These rooms can be used together as a suite or may be reserved separately. Bathed in morning sunlight, the small floral print wallpaper and floral border in this room reflect the antique blue iris surrounding much of Stratton House. Staying in this room will bring back childhood memories. 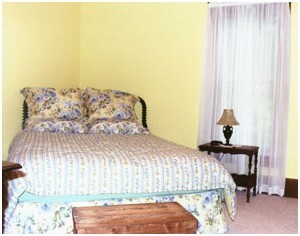 The room features a queen-size bed with an antique, white wrought iron headboard. An antique child's hand-painted wood rocking horse and small, antique steamer trunk are part of the decor. This room sleeps 2 adults. In the afternoon, this room catches the shade of large maple trees that overlook Stratton House. 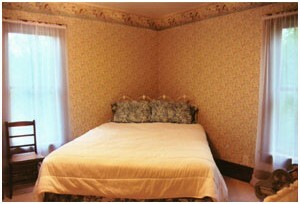 The room features a queen-size bed with a black, antique spool headboard. An antique spool chair complements the headboard. This room sleeps 2 adults. Content: © 2002-2019 Stratton House Inn. All rights reserved.